Robert Berna ’94 (international studies) was born in New York City and raised in Maryland. He returned to New York in 1997, working within the marketing division of New Line Cinema, and then transitioned to a career in advertising after receiving dual MBA degrees from Columbia Business School and the University of California at Berkeley. Berna and his wife, Alison Qualta Berna, met Apple Seeds co-founders Craig and Alison Schlanger in a neighborhood Music Together class. We all know that Dickinson provides an extremely well-rounded education, so coming out of there with such a well-balanced liberal-arts foundation really does set one up for a variety of career options. Dickinson encourages students to explore many fields and topics, which has served me well having now worked in a several different industries. 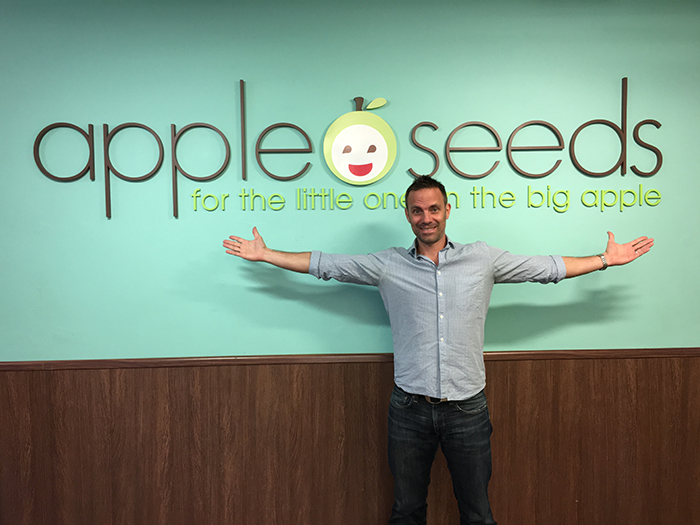 This drive and confidence to explore new territories helped me jump into my current business, Apple Seeds, an all-in-one play space for families with kids newborn to 5 years old. What was the moment when you knew you had a good idea, which led you to pursue your current career/endeavor? When my twin daughters were about a year old, my wife and I met another couple with twin boys that were the same age. Noting the collective lack of quality kids’ activities in our neighborhood in Manhattan, we quickly recognized the need for such a business and decided to launch Apple Seeds together. The true moment when I knew we were onto something great was when we opened for business on March 1, 2007. We had a line of clients wrapped halfway around the block waiting to get into our facility. Don’t be afraid to take a chance. Most people don’t get that many opportunities to launch a business or to join an entrepreneurial effort, so when the opportunity presents itself, you should jump at it. The second piece of advice I would share is that you have to be patient when building a business. A lot of people have the expectation that they can build something, and then sell it and retire after just a few years. That does happen occasionally, but generally it takes some time to build up a quality business, and there is always a learning curve involved when creating something new. Apple Seeds has been around for nine years, but we just recently started franchising our highly popular music program, Songs for Seeds. Since the franchise world is an entirely new landscape for us, this has been like launching a new startup all over again. We’re off to a great start, having already awarded 10 Songs for Seeds franchises across the U.S. in just a few months.